30 in. 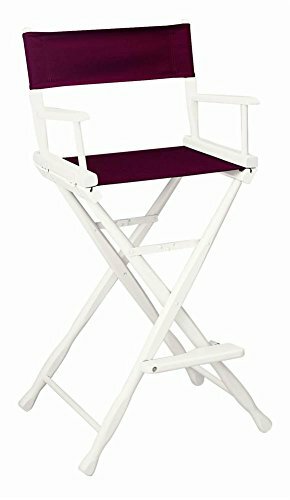 Classic Director's Chair w White Frame & Burgundy Canvas by Gold Medal Chairs at Main Street Living. Hurry! Limited time offer. Offer valid only while supplies last. White Frame and Burgundy Canvas. Sleek comfort shaped arm pads. 1.5 in. thick contoured classic legs. Riveted legs for durability and strength. White Frame and Burgundy Canvas. Sleek comfort shaped arm pads. 1.5 in. thick contoured classic legs. Riveted legs for durability and strength. Reinforced steel mortise and tenon joinery. Provides timeless styling and strength. Rust resistant zinc plated steel hardware. 1 lbs. cotton duck canvas fabric. Made from American beech hardwood. Made in USA. Frame dimension: . Arm height: 37.5 in.. Seat height: 30 in.. Overall: 21.5 in. W x 15.5 in. D x 46 in. H . Fabric dimension: . Seat width between rails: 18.5 in.. Seat depth: 15.25 in.. Back width: 21.5 in.. Back height: 7 in.. The Gold Medal Classic Series Directors chair was first seen in 1892 at the Chicago World's Fair, where it won a Gold Medal for Excellence in Casual Furniture Design. The Classic series directors chair has been the standard by which all other directors chairs are measured. Manufacturer: The Lord's Table, Inc. Publisher: The Lord's Table, Inc. Studio: The Lord's Table, Inc. If you have any questions about this product by Gold Medal Chairs, contact us by completing and submitting the form below. If you are looking for a specif part number, please include it with your message.